Faugh a Ballagh, a corruption of the Irish (Gaeilge), 'Fág an Bealach' meaning 'Clear the Road', or 'Clear the Way' is first recorded as being shouted by the men of the 2nd Battalion of the 87th Regiment, later The Royal Irish Fusiliers, as they charged the French at the Battle of Barrosa on 5 March 1811. After this great victory, the Regiment became known as 'the Aigle*-Catchers' and the 'Faugh–a-Ballaghs'. The latter soon became the official battle cry or motto of the Regiment and is today emblazoned on the Regimental Colours of The Royal Irish Regiment. 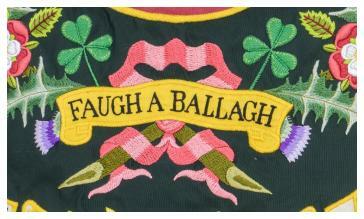 For further reading on the origins of the Green Hackle and the Motto please click on Faugh a Ballagh. The French word, 'l'aigle' translates into English as 'the eagle'.